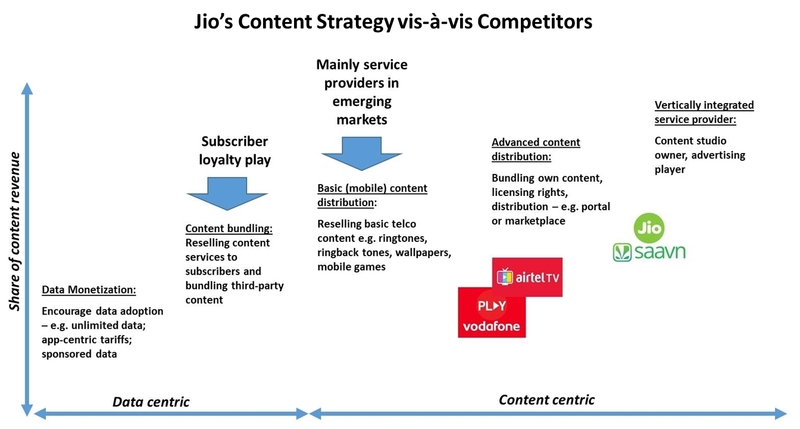 BOSTON--(BUSINESS WIRE)-- Reliance Jio will face a challenge to monetize users of its entertainment apps as it migrates from free subsidized content to a freemium model in future, according to a new report from Strategy Analytics “ Reliance Jio Targets Digital Content Leadership .” Reliance Jio is one of the most advanced mobile providers with respect to content, using its free entertainment apps to differentiate from competitors, build subscriber loyalty and create opportunities for future growth. However, willingness to pay for digital content remains low in India. Identifying content that users are willing to pay for combined with business models and a user experience that resonates with target customer segments will be critical for successful monetization. Jio has recently merged its music service, Jio-Music, with competing digital music provider Saavn, integrated with Eros International’s video platform, and signed a multi-year deal with Roy Kapur Films to develop content for Jio branded apps. Jio is also able to lean on the media business of its parent company, Reliance, which has its own over-the-top (OTT) video service called BIGFLIX and stakes in TV networks in addition to TV and film production houses. Monetization of Media Content (Graphic: Business Wire).